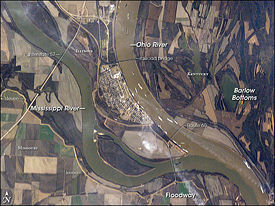 The Ohio River is the largest tributary by volume of the Mississippi River. It is approximately 981 miles (1,579 km) long and is located in the eastern United States. Flowing through or along the border of six states, its drainage basin encompasses 14 states, including many of the states of the southeastern U.S. through its largest tributary, the Tennessee River. Its basin is one of the most populated and industrialized regions of the United States. The Ohio River is a climatic transition area as its water runs along the periphery of the humid subtropical climate and humid continental climate thereby being inhabited by fauna and flora of both climates. The Hopewell culture developed on its shores 2,000 years ago. By the seventeenth and eighteenth centuries, when discovered by the white man, its valley was home to numerous Native American tribes, one of which—the Seneca—gave it its name, "Ohiyo," which means "beautiful river". The Ohio continued to play an important role in American history as a primary transportation route during the era of westward expansion. Because it serves as the southern border of Ohio, Indiana and Illinois, the Ohio River was a part of the border that divided free states and slave states in the years before the American Civil War. Before and during the Civil War, it was called the "River Jordan" by slaves escaping to freedom in the North via the Underground Railroad. More routes, and more escaping slaves made their perilous journey north to freedom across the Ohio River than anywhere else across the north-south frontier. Today, the Ohio River is the generally accepted dividing line separating the Midwestern Great Lakes states from Southern border states. Since it was considered by pre-Columbian inhabitants of eastern North America to be part of a single river continuing on through the lower Mississippi, it is perhaps an understatement to characterize the Ohio as a mere tributary of the Mississippi River. The river is 981 miles (1,579 km) long and carries the largest volume of water of any tributary of the Mississippi. The Indians and early explorers and settlers of the region often considered the Allegheny River to be part of the Ohio, and the forks (the confluence of the Allegheny and Monongahela rivers at what is now Pittsburgh) was considered a strategic military location. The river is formed by the confluence of the Allegheny and Monongahela rivers at Point State Park in Pittsburgh, Pennsylvania. From Pittsburgh, it flows northwest through Allegheny and Beaver Counties, before making an abrupt turn to the south-southwest at the West Virginia—Ohio—Pennsylvania triple state line, from which point it forms the border between West Virginia and Ohio, upstream of Wheeling, West Virginia. The river then follows a roughly southwest and then west-northwest course before bending to a west-southwest course for most of its length. It flows along the borders of West Virginia, Kentucky, Ohio, Indiana, and Illinois, until it joins the Mississippi near the city of Cairo, Illinois. The Ohio River is young from a geologic standpoint. The river formed on a piecemeal basis beginning between 2.5 and 3 million years ago. The earliest Ice Ages occurred at this time and dammed portions of north flowing rivers. The Teays River was the largest of these rivers, and the modern Ohio River flows within segments of the ancient Teays. The ancient rivers were rearranged or consumed by glaciers and lakes. 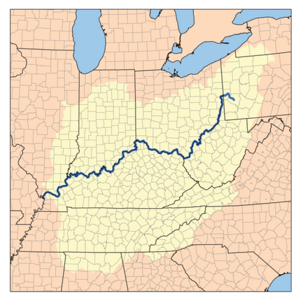 The upper Ohio River formed when one of the glacial lakes overflowed into a south flowing tributary of the Teays River. Prior to that event, the north flowing Steubenville River (no longer in existence) ended between the towns of New Martinsville and Paden City, West Virginia. Likewise, the south flowing Marietta River (no longer in existence) ended between the cities. The overflowing lake carved through the separating hill and connected the rivers. The resulting flood waters enlarged the small Marietta valley to a size more typical of a large river. The new large river subsequently drained glacial lakes and melting glaciers at the end of several Ice Ages. The valley grew with each major Ice Age. Many small rivers were altered or abandoned after the upper Ohio River formed. Valleys of some abandoned rivers can still be seen on satellite and aerial images of the hills of Ohio and West Virginia between Marietta, Ohio, and Huntington, West Virginia. The middle Ohio River formed in a manner similar to formation of the upper Ohio River. A north-flowing river was temporarily dammed southwest of present-day Louisville, Kentucky, creating a large lake until the dam burst. A new route was carved to the Mississippi River, and eventually the upper and middle sections combined to form what is essentially the modern Ohio River. 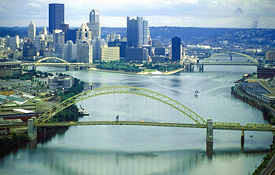 The Allegheny river (left) and Monongahela river (right) join to form the Ohio River at Pittsburgh, Pennsylvania, the largest metro area on the river. Cincinnati, Ohio is a well known city along the Ohio River, historically known for its riverboats. 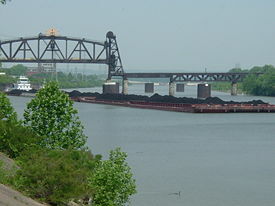 The Tall Stacks festival annually celebrates this connection between Cincinnati and the Ohio River. The Scioto River in Ohio, a tributary of the Ohio River. 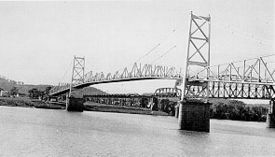 Silver Bridge in Point Pleasant, West Virginia which collapsed into the Ohio River in 1967, and gained notoriety through John Keel's 1976 book and subsequent 2002 movie The Mothman Prophecies. 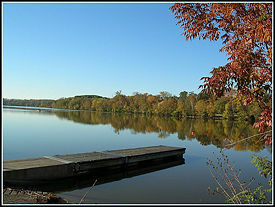 While the Ohio River is quite deep, it is a naturally shallow river that was artificially deepened by a series of dams. The dams raise the water level in shallow stretches, allowing for commercial navigation. Near its origin at the confluence of the Allegheny and Monongahela Rivers, the Ohio remains fairly shallow, never rising above around 30 feet (nine meters) all the way past Cincinnati. From its origin to Cincinnati, the average depth is approximately 27 feet (eight m). However, once past Cincinnati, the river deepens substantially. Due to the damming, along with glacier formations and migrations in the latter part of the second Ice Age, the river's depth increases nearly fivefold over about 100 miles (161 km), coming to a maximum depth of 168 feet (51 m) just west of Louisville, Kentucky. The 50 miles (80 km) around Louisville represent the deepest area of the river with an average depth of approximately 132 feet (40 m), allowing for much larger vessels to traverse the river. 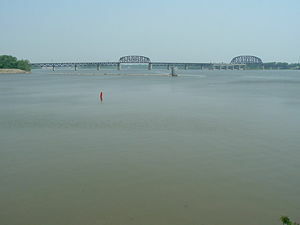 From Louisville, the river loses its depth very gradually until its confluence with the Mississippi at Cairo, Illinois, where it has an approximate depth of 20 feet (six m) because it is freer flowing. The natural depth of the river varies from about three feet to 40 feet. Native Americans have occupied the Ohio River Valley for about 15,000 years, traveling and trading on the river and its tributaries. An elaborate culture and extensive trading networks were developed about 2000 years ago, now termed the Hopewell culture. Their most prominent archaeological remains are burial mounds found throughout the region. In the eighteenth century, the Native tribes inhabiting the Ohio Valley were the Shawnee, Miami, Omaha, Erie, and Susquehannock. The first known European explorer to travel the river was French explorer René-Robert Cavelier, Sieur de La Salle, in 1669. On May 19, 1749, King George II of Great Britain granted the Ohio Company a charter of land around the forks. Exploration of the territory and trade with the Indians in the region near the Forks by British colonials from both Pennsylvania and Virginia—both of whom claimed the territory—led to conflict with French forces that also claimed the region and had built forts along the Allegheny River. This directly led to the French and Indian War in North America. The French and Indian War was part of a more global conflict—perhaps the world's first truly global conflict—the Seven Years' War between England and France. After several initial defeats, the British eventually gained sovereignty over the Ohio Valley. In 1774, the Quebec Act restored the land east of the Mississippi River and north of the Ohio River to Quebec, appeasing the French-speaking British subjects, but angering the 13 Colonies. They listed it as one of the Intolerable Acts, which precipitated the American Revolution. 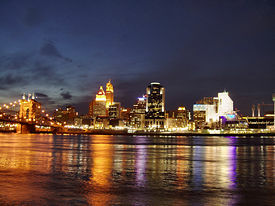 Louisville, Kentucky was founded at the only major natural navigational barrier on the river, the Falls of the Ohio. The Falls were a series of rapids where the river dropped 26 feet (7.9 m) in a stretch of about two miles (3.2 km). In this area the river flowed over hard, fossil-rich beds of limestone. The first locks on the river were built at Louisville to circumnavigate the falls. Today it is the site of McAlpine Locks and Dam. Because the Ohio River flowed westward, it became the convenient means of westward movement by pioneers traveling from western Pennsylvania. After reaching the mouth of the Ohio, settlers would travel north on the Mississippi River to St. Louis, Missouri. There, some continued on up the Missouri River, some up the Mississippi, and some further west over land routes. In the early nineteenth century, pirates, such as Samuel Mason, settled at Cave-In-Rock, Illinois, waylaid travelers on their way down the river, killed them, stole their goods, and scuttled their boats. The folktales of Mike Fink recall the keelboats used for commerce in the early days of European settlement. In 1843 the Ohio river boatmen were the inspiration for Dan Emmett's The Boatman's Dance. Other boats traveled south on the Mississippi to New Orleans and sometimes beyond to the Gulf of Mexico and other ports in the Americas and Europe. This provided a much needed route for goods from the west, since the trek east over the Appalachian Mountains was long and arduous. The need for access to the port of New Orleans by settlers in the Ohio Valley led to the Louisiana Purchase in 1803. Because it serves as the Southern border of Ohio, Indiana and Illinois, the Ohio River was a part of the border that divided free states and slave states in the years before the American Civil War. The expression "sold down the river" originated as a lament of Kentucky slaves being split apart from their families and sold in Louisville and other Kentucky locations to be shipped via the Ohio River down to New Orleans to be sold yet again to owners of cotton and sugar field plantations. Before and during the Civil War, the Ohio River was called the "River Jordan" by slaves escaping to freedom in the North via the Underground Railroad. This was depicted in several novels by Harriet Beecher Stowe and Toni Morrison. More routes, and more escaping slaves made their perilous journey north to freedom across the Ohio River, than anywhere else across the north-south frontier. In 1831, in the Ohio River town of Ripley, Ohio, an irate slave catcher, in hot pursuit, coined the term, "Underground Railroad," when his quarry apparently 'just vanished' in one. Ripley was a hotbed of abolitionist activity. Runaway slaves were generally welcomed there. And free-to-operate-in-the-north Slave Catchers also worked openly in Ripley. Farther down the river, near Grandview, Indiana, slave Josiah Henson began his daring escape toward freedom with his entire family. Today, the Ohio River generally separates Midwestern Great Lakes states from Southern border states. The charter for Virginia went not to the middle of the Ohio River but to its far shore, so that the entire river was included in the lands owned by that state. Therefore, where the river serves as a boundary between states, the entire river belongs to the states on the east and then the south (West Virginia and Kentucky) that were divided from Virginia. It is for that reason that Wheeling Island, the largest inhabited island in the Ohio River, belongs to West Virginia, even though it is much closer to the Ohio shore than to the West Virginia shore. Kentucky brought suit against Indiana in the early 1980s because of the building of the Marble Hill nuclear power plant in Indiana, which would have discharged its waste water into the river. The U.S. Supreme Court held that Kentucky's jurisdiction (and, implicitly, that of West Virginia) extended only to the low water mark of 1793 (important because the river has been extensively dammed for navigation, so that the present river bank is north of the old low water mark.) Similarly in the 1990s, Kentucky disputed Illinois' right to collect taxes on a riverboat casino docked in the town of Metropolis, citing their control of the entire river. Aztar opened their own casino riverboat that docked in Evansville, Indiana at about the same time. Although cruises on the Ohio River were at first done in an oval pattern up and down the Ohio, the state of Kentucky soon protested and cruises were limited to going forwards then reversing and going backwards on the Indiana shore only. Mississippi (the northeast corner of the state). The Ohio River has been an important transportation route since the early days of settlement. The river has fairly uniform flow and is navigable throughout its length. It has a total fall of only 429 feet (130 metres), the one major hazard to navigation being the Falls of the Ohio at Louisville, where locks control a descent of about 24 feet (seven meters) within a distance of 2.5 miles (four km). A channel of nine feet (2.7 m) is maintained along the river's entire course, and a series of 13 dams with locks ensures passage of recreational vessels as well as commercial ships which carry cargoes of coal, oil, steel, gravel, petroleum products and manufactured goods. The largest metropolitan areas along the Ohio's banks are: Pittsburgh, Pennsylvania (2.4 million); Cincinnati, Ohio (2.0 million); Louisville, Kentucky (1.2 million); Evansville, Indiana (350,000); and Huntington, West Virginia (290,000). The principal river ports are Cincinnati, Louisville, and Pittsburgh. 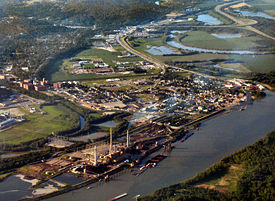 The Ohio River basin is one of the most populated and industrialized regions of the United States. Industrial and municipal pollution adversely affected eight states—Illinois, Indiana, Kentucky, New York, Ohio, Pennsylvania, Virginia and West Virginia—who, in 1948, ratified the Ohio River Valley Sanitation Compact for the purpose of abating water pollution. As a result of their cooperation in establishing standards and practices, the river now supports marinas and recreational facilities as well as provides drinking water and waste disposal to communities along its banks. While the habitat of the river has been modified by navigation systems and flood-control walls and levees, its banks continue to support a rich hardwood forest. Numerous fish species include catfish, carp, and buffalofish. ↑ National Weather Service, River Watch - Ohio River Basin Retrieved June 24, 2008. ↑ Guy Mendes, Kentucky's Underground Railroad Kentucky Educational Television. Retrieved June 24, 2008. ↑ John C. Inscoe, Appalachians and race: the mountain South from slavery to segregation (Lexington: University Press of Kentucky, ISBN 9780813121734). ↑ J. Blaine Hudson, Crossing The "Dark Line": Fugitive Slaves and the Underground Railroad in Louisville and North Central Kentucky Kentucky Educational Television. Retrieved June 24, 2008. ↑ Encyclopædia Britannica Online, Ohio River Retrieved June 24, 2008. ↑ Ohio River Valley Water Sanitation Commission, Pollution Control Standards for discharges to the Ohio River Sierra Club. Retrieved June 24, 2008. Answers Corporation. Ohio River Retrieved June 24, 2008. MS Encarta. Ohio (river) Retrieved June 24, 2008. U.S. Army Corps of Engineers. Ohio River Information Retrieved June 24, 2008. This page was last modified on 14 February 2015, at 22:24.